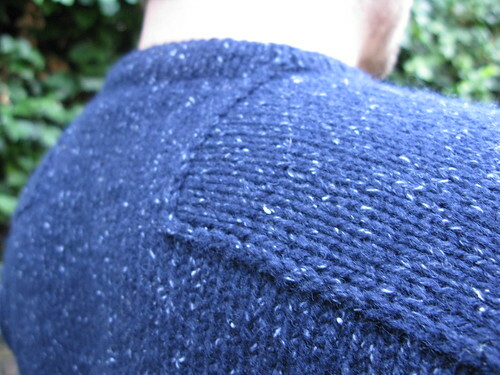 Lovely jumper, and thanks for the sock pattern link. I've been meaning to make a pair like that in ages! Both are beautiful! Rather than knit my boyfriend a curse sweater, I'm teaching him to knit- I'll have to show him your sweater. aweseome sweater! I love it!! Sweater is beautiful! Socks, too! Those socks are fab - I'll have to bear that pattern in mind. and the sweater looks great. I adore the New Lanark stuff - it's such good value and great quality! oh wow, those socks and that sweater are simply stunning!! Awesome FOs. The Seamless Hybrid is a winner for sure, and watching The Sound of Music on Christmas sounds like a lot of fun, lucky bro! 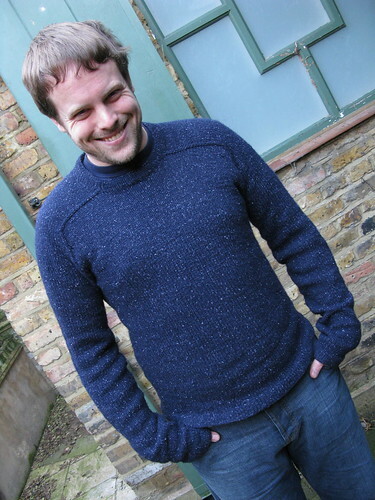 Cute man made even cuter in hand knitted jumper. 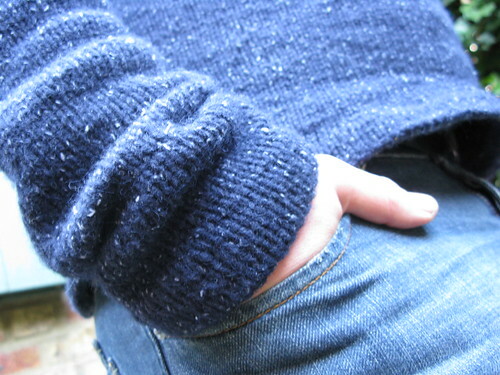 Good man wot wears knitted jumper. Good woman wot knits for good man. looks like your BF loves his sweater! he's positively glowing :) merry christmas and happy new year! Both are beautiful FOs! I've been contemplating those socks to see if a non-traditional pattern would bring my sock mojo back! Happy New Year! Gosh, I see what you mean about the cost of that yarn! Incredible! Impressive boyfriend sweater! I think the long arms makes it quite snuggly. I just ran across your scarf in the Spring 06 Knitty and I wanted to thank you for taking the time to explain how to turn the work and twist the strands. 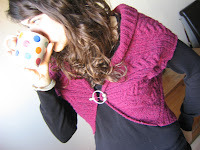 I wasn't sure how I was suppose to make the edges of a double knit close up (for lack of a better phrase) and now I see it's so simple, but I wasn't finding any really good instructions. So thank you. 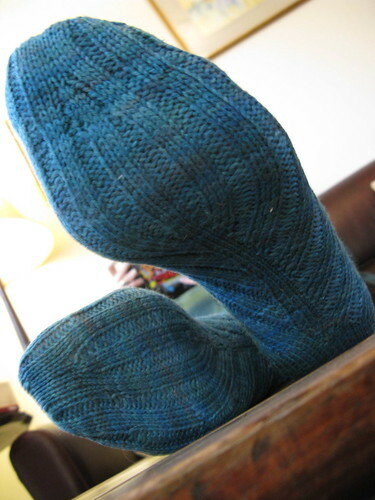 The arch shaped socks are fantastic in rib, that really makes the pattern! Gorgeous! Aren't those Arch socks fantastic and snug? Lovely shades of blue you chose. I cried buckets about how much shipping it cost for the Lanark yarn, but at least I can admire yours!! 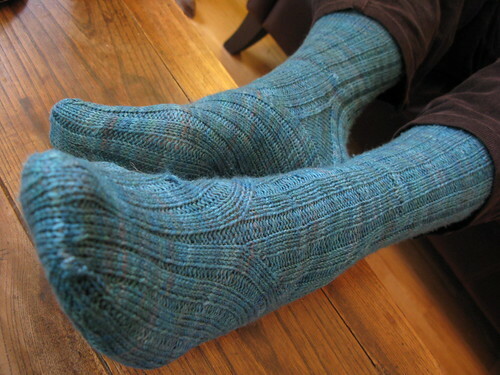 This is a really late comment, but I surfed to your page from someone else's Ravelry comments about your arch-shaped socks. 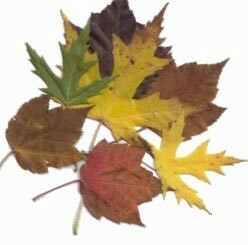 I like the overall ribbed idea and your photos gave me a good idea of how they will look. Gorgeous photos, gorgeous colour!